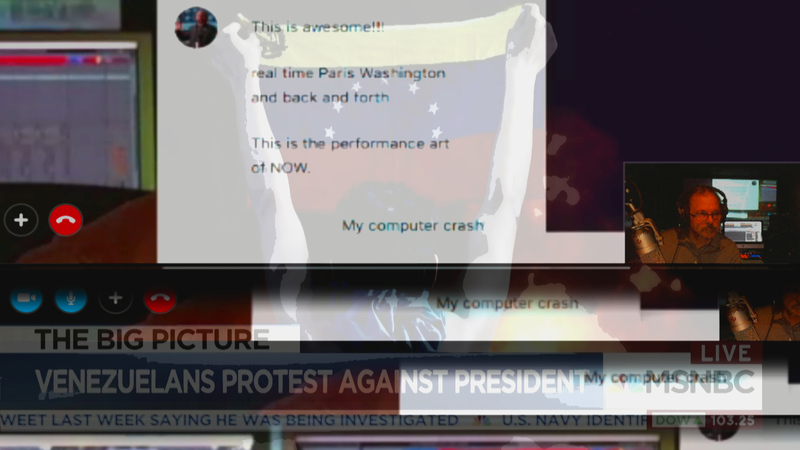 In my Underground Studio Bunker in Washington, DC, I am creating a live performance space for 24/7 Internet broadcasting over the Third Space Network (3SN). 3SN is for programming ANYTHING I want, WHENEVER I want, without any traditional gatekeepers, curators, dealers, or anyone else telling me what I can or cannot do. 3SN is a social sculpture uniting viewers, artists, radicals, anyone who dares to participate in an ongoing dialogue in the third space, not bound by distance culture or geography. The Bunker is a secure place for the 3SN Broadcast, where I can challenge all forms of the status quo: art, politics, media and life itself. It is a living breathing space for my work accessible ANYWHERE in the world. In the bunker, I can infiltrate messages at will in the form of music, visual art, multimedia, spoken word, poetry, rants, manifestos, etc., ANYTHING ANYTIME 24/7. The Bunker can be described as an Autonomous Free Zone of anarchic behavior where ANYTHING goes in the form of artistic expression. It is free and independent and there is NO authority to suppress my voice, NONE, whatsoever. The Bunker takes free expression to the extreme, crucial in these times of crisis and the destruction of truth. In the Bunker, truth reigns supreme, and so does satire and cutting critique and the manipulation of EVERYTHING in the spirit of total expression and artistic reportage. I do not have to cater to ANY art scene because I am creating MY OWN scene in the Bunker. Anyone can choose to join me or NOT, this makes no difference, because what is crucial is I am exercising FULLY my democratic right to speak out and not be constrained by ANYONE: not from the arts, government, or academia. I will keep my BROADCAST (A)live for as long as I am breathing and able to speak my mind.